phpDocumentor 2 is a free tool that lets you generate documentations from within your PHP code, in this way your customers are more aware of the functionality embedded in your code. All customers are well aware of the functionality of their programs from Graphical end, but it’s important for some customer to know the technical and coding side of the application as well, this is where PHPDocumenter 2 app comes in handy. One of the most important use of this tool is Code Analysis, PHPDocumenter has capability to extract data and present it in better visual forms like charts or graphs. You can generate inheritance diagrams using this app, so it will let you display all subclasses, it can report deprecated elements and TODO details from within the code itself. Its flexible template system lets you modify output in many different ways. phpDocumentor needs PHP-Pear package installed. It’s a pear module actually and in order to install it Pear must be working on your system. 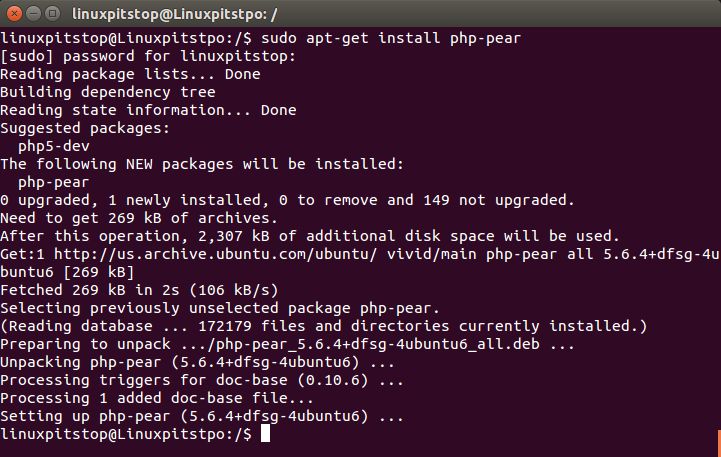 Launch your ubuntu system terminal and run following command to install PHP-Pear package. As a PHP developer or System administrator, you might already know that before attempting to install packages via Pear, it must discover the channels first. Run following pear discovery command on your terminal now. That’s all, now run following command on the terminal to install PHPDocumenter2. The installation process will start now, It will take couple of min. Congratulations, PHPDocumentor has been installed now. PHPDocumentor is a powerful tool and its future enhancements will make it more useful. Simple to configure, and easy to use – it can help maturing your software applications to great extent.